"Being involved with IPWEA and being able to network with more experienced public works professionals is a great part of being a member, although to date I feel that my involvement in the development of Young IPWEA in Vic has been a highlight, and something I will look back on and cherish as a very valuable experience...."
“As a member of the IPWEA, I had the opportunity to host undergraduate work-placement students. I found it particularly rewarding giving them the hands-on public works industry perspective not covered academically..."
Student Member: This grade of membership is available to persons not in full time employment and enrolled in full time or part time undergraduate studies in an accredited/recognised educational program in Australia or New Zealand (University or TAFE). The maximum term for Student membership is 6 years. Group Membership – Contact your local IPWEA Division for information on group discount membership pricing (min 5 or more members). *** Note: Quarterly pro-rata membership rates are applied to the above $ amounts where not a full membership year. 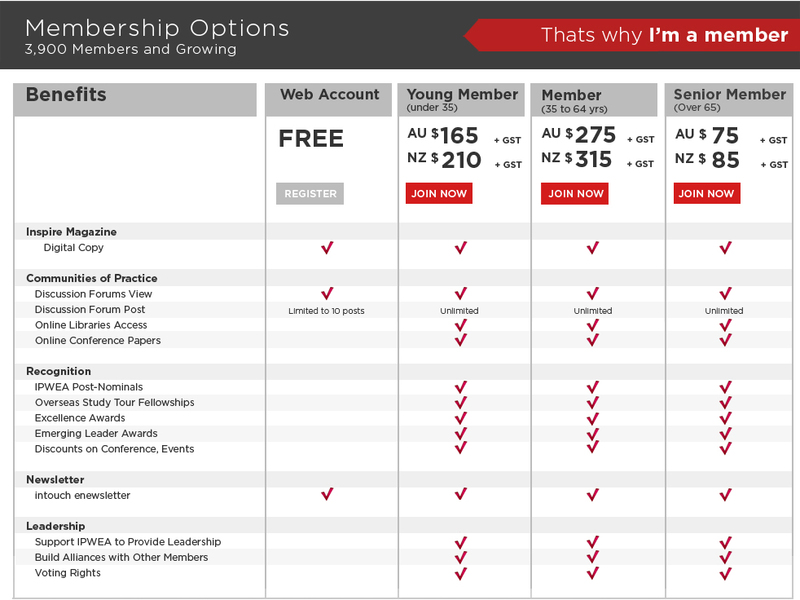 If you sign up in the last quarter, you will receive 15 months membership for the price of 12 months.